Phewwwwwww. I feel like I just need to take a huge breath in and an even bigger breath out. Inhale, exhale, inhale, exhale. The last couple of weeks have been crazy in the SIL world and we've hardly had a minute to ourselves - but finally, the craziness has died down a tiny little bit and we're back to a relatively normal level of crazy. But when things get crazy, you've still got to eat - so we've been relying on quick, easy meals that can be packed up and eaten on the run. That's why whenever I had a spare second over the last couple of weeks, I was making raw bites. They're small, compact, filling and portable and the perfect snack for busy days... but the best thing? You can create whatever flavour you feel like! 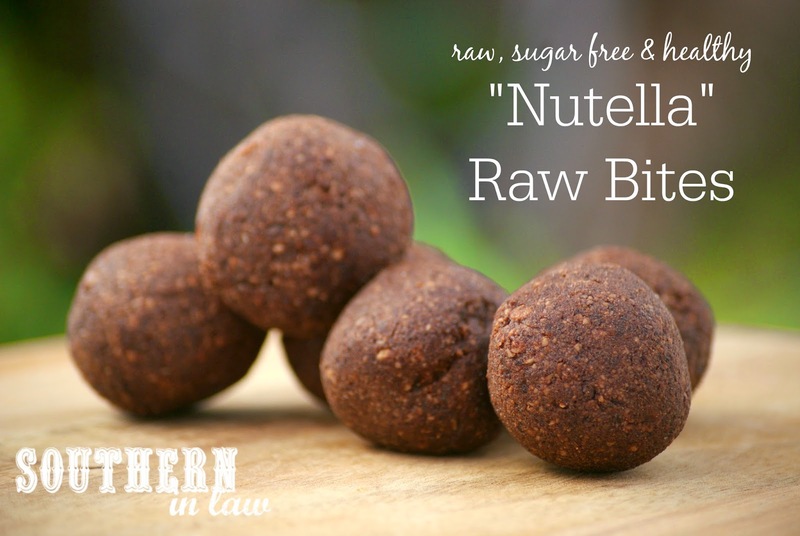 I had some hazelnut meal in the pantry when I went to make this batch of raw bites and I knew immediately what I had to make - "Nutella" Raw Bites! 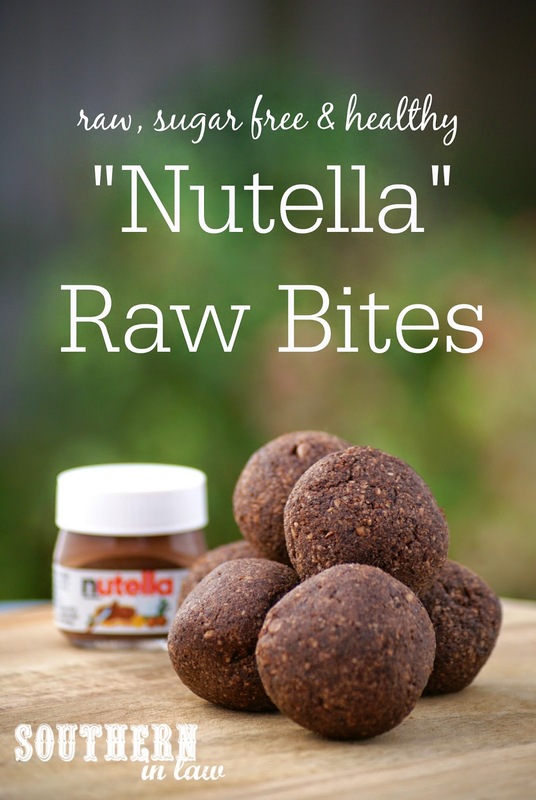 That is, a healthy raw bite with all of the flavour of nutella but without using a single spoonful of nutella. They're raw, gluten free, sugar free and ab-so-lute-ly delicious. You'll probably want to do a happy dance - and then you'll probably want to tell the world how brilliant you are for creating something that's totally healthy yet tastes ridiculously decadent. Place your dates into your food processor and process until dates break up and form a clump. Add your hazelnut meal, cocoa powder and vanilla and process until the mix begins to combine. If your mix isn't coming together, add water a few drops at a time until your mix begins to form into a ball. You don't want the mixture too wet, you just want to be able to form it into bites. If adding chocolate chips, stir them through your mixture. 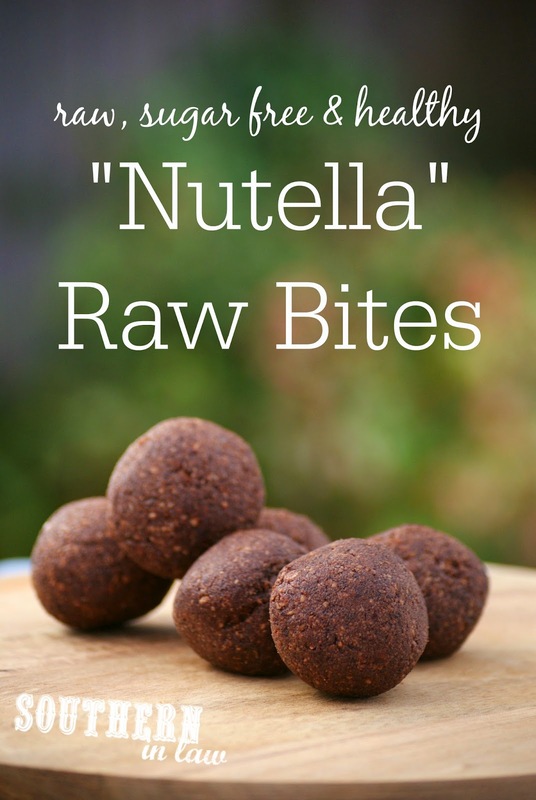 Roll your raw bite mix into bites and place onto a plate. Once you've finished rolling, pop your raw bites into the fridge to firm up or devour as is! These also store for months in the freezer - just take one out whenever you feel like one or they will last for a couple of weeks in the fridge. But tell me, what are your go-to meals when you're in a rush or on the go? And how do you like to wind down after a busy week? Weirdly enough, the ways I wind down are usually ways to get busy - I love to bake up a storm after a busy week where I haven't spent much time in the kitchen - or I like to hang out with friends!